This book is a gift to yourself! France's life experiences will touch you to the core. You will feel like she Is both your friend and wise guide.She gives us the way forward via what she learned on her path. This book shifts and empowers the reader to truly live ones life authentically and boldly! How to discover, embrace, transform and empower yourself through the broken pieces of your life. After recalling tragic events such as physical, verbal, emotional abuse in childhood and in relationships, overcoming health challenges and the suicide of a loved one, the author discovers that past unhealed emotions are still part of her. As she unravels the gift in each broken piece of her life she gains the freedom to live her life with joy, renewal, peace and strength. This book is an invitation to take a second look at your own life. Avoiding the past is not the answer. Honoring it becomes the solution. Discovering unhealed emotions becomes a protective shield against their negative effects in the present. 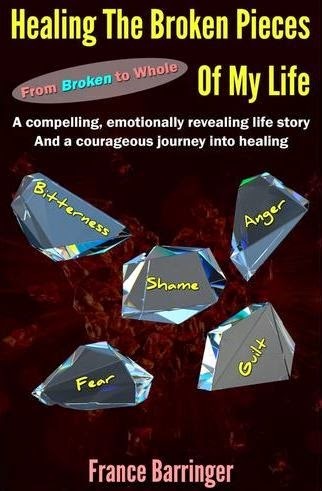 In this “can’t put it down” life story, the author encourages you to heal your own life by following a step-by-step guide, Healing the Broken Pieces of My Life and Yours, a companion to this book to help you find your own way to the freedom and peace that you truly deserve. You don’t have to remain broken . . . Whole is what you are meant to be.